I am a very big fan of the golden age of Hollywood, while I don’t write about it that often or even incorporate it in my reviews or writing that often, I have immense respect for it and its stars. I long for the days when legends like Garbo, Bogart, Bacall, Wayne, Stewart and Hepburn would have their equals walk the red carpet today in their prime. There definitely are a few of those giants today, including those that were phenomenal and died too soon, like James Dean and Montgomery Clift. To find the best of the best, you need not look further than the red carpet at yearly events like the Cannes Film Festival and the Sundance Film Festival. These actors, writers and directors proudly display their best work before these prestigious audiences. These titans include, Woody Allen, Francis Ford Coppola and even Martin Scorsese. Foster, debuted her newest feature at Cannes, With stars George Clooney and Julia Roberts on hand to help her unveil the movie, they were one of the highlights of the red carpet. Clooney and Roberts looked as if they were Bogey and Bacall, without the romance. They had the look and glow of the Hollywood royalty I spoke of before. The comfort level they both have with each other can be felt even through the pictures 5,000 miles away. You can’t help but wish they actually were a couple. The film Money Monster debuted to an A list audience and didn’t disappoint. Having now seen the film three weeks after its debut, I can see why. Money Monster is the perfect companion film to movies like The Big Short. I don’t say the answer or counter piece because it delves deeper into the average persons emotions and mind set who lost everything in the current system’s economy. It is the story of a television financial adviser who has recently given his endorsement to a stock he claims, can’t lose. When the stock goes belly up, a young, blue collar investor soon takes the television host, played by Clooney, hostage demanding answers and reparations. When Lee, the host, can’t provide what he demands, he straps him with a bomb until his demands are met. As the crisis goes along, more is learned about each character and the situations that have brought them to this point. George Clooney stars as Lee Gates in TriStar Pictures’ MONEY MONSTER. stocks and their promotions from the media. This comes as no surprise to the average viewer, but nevertheless doesn’t stop us from taking their word for the facts and advice they give on television. It is the discovery of all of this that sends the young man on the rampage in which he demands justice, not just for his loss, but for all those that have lost along with him. Money Monster is relatable on not only the financial level, but on the injustice level. You easily feel his anger and become mad at the knowledge of how hard working and middle and lower class families are affected by these situations. When they trust in a media that wasn’t supposed to lie to them and a system that wasn’t set up to swindle them. I recently felt these emotions, not only in this film, but in Michael Moore’s latest film, Where To Invade Next, which looks at old American ideas that are in place in other countries, and are benefiting the masses, unlike America. It is hard not to feel these effects, but it is what we will do and we will go on with our lives. The one thing we know is that these are institutions that don’t have our best interests at heart and never will. We need to take care of ourselves and do what we know is right and what will benefit us. Alexander Payne has quickly raised to the top of the cream of directors list. Each film has gotten better than the last. His last was a pure polished masterpiece with George Clooney in The Descendants. His latest is as good as his first and as touching as his last. His films have a great mix of dramatic comedy unlike anyone making films right now. 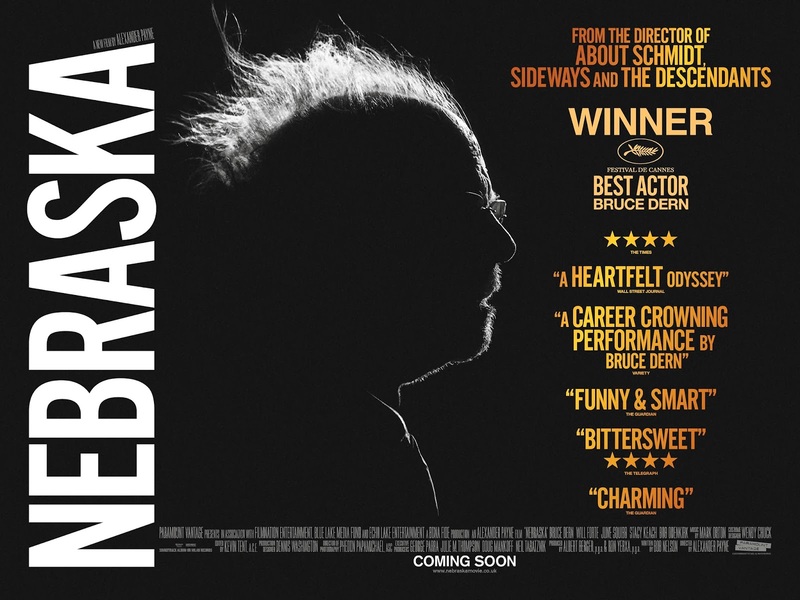 Nebraska is the touching heartfelt story of an aging, booze riddled man from Butte, Montana who believes he’s won a million dollars and is determined to claim his fortune by making his way to Lincoln, Nebraska come hell or high water. When his loyal son reluctantly son agrees to take time out of his schedule to drive his father to Lincoln to prove to him it’s a scam. Along the way Woody (Bruce Dern) meets many long lost family members and old acquaintances who try to pull money from him because of his giving nature. When things go terribly wrong Woody’s son keeps his word and drives him to Lincoln to see if he has won. The story is of a family dangerously close to falling apart and one who has experienced hard times as well as hard living. But there is still love there. Woody’s son can still see that underneath all this his father still has love for himself and his brother. 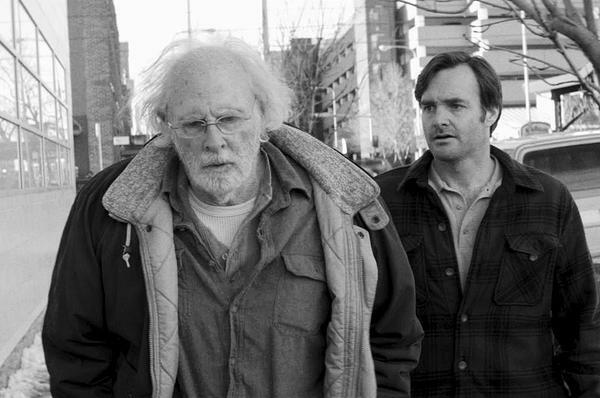 Will Forte and Bruce Dern give performances that light up the screen and have a father son bond that is so genuine you have a true feeling for them both. Despite knowing Woody’s letter is most likely a fake you just want some good fortune to fall upon the family that needs something right to go it’s way. In the end Forte feels his fathers love and is the one who helps him feel important and lucky. Alexander Payne has such a genius way of pulling such unhappy and serious situations and finding the light in them. He is a true film maker in every sense of the word in our time. His relatable characters can be identified with in many aspects by so many. It is a film that film lovers will cherish and feel good about having seen this year. All nominations and any awards are more than deserved. Some times, certain films have a quality or way of being made that make everything line up just right. Some parts of the movie may not be particularly great yet when put together as one it is a very good, or even great, film. I found this to be the case with Alfonso Cuaron’s, Gravity. Despite starring two Oscar winning performers, and only two Oscar winning performers (for the most part) I did not find it to a wonderfully acted film. Not that I would say it was badly acted by any means, it’s just not George Clooney’s or Sandra Bullocks strongest performance throughout, although Bullock does a wonderful job in the second half of the film. But when the elements of plot, stunning visualization and story and the acting are all brought together, a masterful film is the end result. This is the story is one of two main characters and those are the only faces seen. 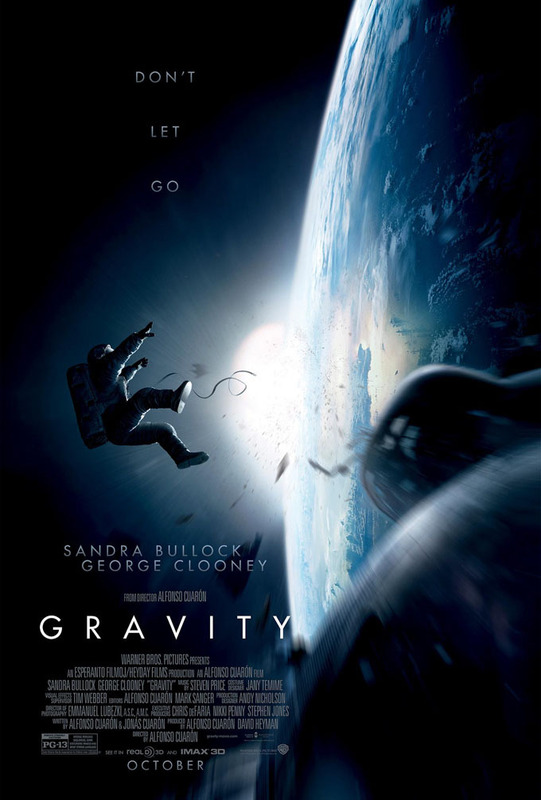 a medical engineer (Bullock) and a veteran astronaut (Clooney) are on a space walk when debris from a damaged satellite rips through their ship and equipment leaving two other crew members dead and an unusable ship. They are essentially floating through space and attempting to reach the international space station for any hope of returning home. This leaves astronaut Matt Kowalski to help the unprepared and inexperienced Dr. Stone make it through the unimaginable ordeal. It may at first thought seem an impossible task to maintain an engaged audience for the length of a film with just two principles and a seemingly do or die situation as a story line. The way Cuaron has written and constructed the film is nothing short of spectacular. The level of intensity and emotion he gets the audience to invest is at such a high level, it leaves the viewer exhausted. The visual effects, which include wonderful 3D effects are those on rival with what is seen from NASA cameras themselves in space. It is truly a perfect space film and possibly the best and most intense space film in decades. It has a simplicity and beauty that lends itself among the best stories told in movies this year. As award season draws near, expect Gravity to be in contention for a good portion of the major categories. It has an outside chance of being that film that is just too well made to ignore and could possible over take the heavily favored, 12 Years A Slave for the best picture of the year or even bring Cuaron some well deserved hardware. With all that said, one things for certain, Gravity is a film that that will draw you in keep you there till the final credits roll. A great talent in the writing world was lost today when Elmore Leonard succumb to effects of a stroke he recently suffered at age 87. Movie fans will be familiar with Leonard’s work through the films and television that were adapted from his immense body of work. Most notably in 1957 his short story set in the old west about an outlaw who is being transported is unexpectedly left in the hands of a lowly farmer to get him to the train for prison transfer. Glenn Ford would go on to star in the classic western story 3:10 To Yuma which would send Leonard’s work on a blazing trail to the silver screen for the next 56 years. The film would go on to find a new audience and have new life when mega-stars Christian Bale and Russell Crowe would star in the remake 50 years later. In between those years some of his best work work would go on to be made into film by such film making giants as Quentin Tarantino, Barry Sonnenfeld and Steven Soderbergh. 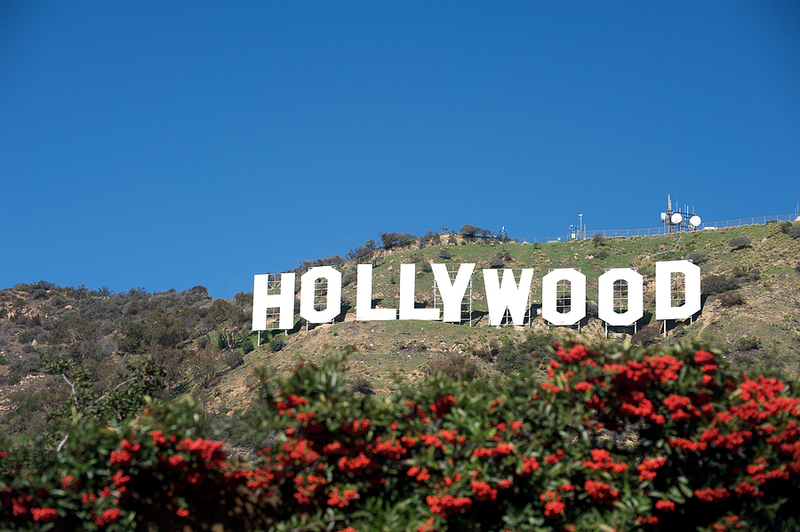 Stars from all aspects of Hollywood would star in his films and they would certainly be highlights of their careers. When it came to crime dramas and stories it could be argued that no one did it better than Elmore Leonard. Mr. Leonard wrote until he physically could no longer do so as he was working on a new novel at the time of his death. He was the quintessential writer and a man whose passion for his craft ran deeper than anyone can ever know. He had a knack for in depth crime stories and twists throughout a story that will make your head spin. Hollywood and the literary world lost a giant today and no matter what medium you knew his work through, if you were a fan, no doubt you are saddened at this news. We will have a few more films be released soon based on his work and without a doubt the series Justified will carry on and do so in a manner to best honor this writing giant. It’s been quite sometime since the film industry has experienced a banner year such as it did this year. The theaters set record numbers, not just in the summer, but throughout the year. The awards season seemed to be one of the most successful in recent memory with phenomenal winners in all aspects. Where the film industry has really seen it’s increase is with the access of streaming movies. With more sources coming out and the ability to watch all online videos directly on their TV’s with the advent of smart TV’s and video devices the movie industry has never been more accessible. There are many reasons for the increase in revenue and the biggest key has to be is that the money is being put back into the movies. Its not a case where the money is going all to the actors top price billing and there is nothing left for development. Actors salaries have seem to come down and are willing to take less for the good of the movie. a prime example is George Clooney who makes the movies he wants to make and more often takes a salary of scale so the film is never compromised and it has proved to suit him well as he might be one of the most respected people in Hollywood. The second reason is the story and effects are being molded wonderfully and not nearly as much is being rushed out just for the sake of having it come out. The film makers are being given the time and resources they need to make the best product available. 3D has raised ticket prices but has not seemed to slow down audiences from flocking to the theater to see there favorite superheroes come to life right in front of them. While it still seems to be gimmick to some, there have been advances in the technology that have made the films look and feel better. A key example was Peter Jackson’s release of The Hobbit and a new speed of film and that seemed to be a smash success. If this year is any sign of things to come, than movies fans have a lot of good things to look forward to. Nothing can disrupt a pleasant conversation or even a deep friendship like politics. Views and loyalties in the political arena run deep and are very strong for a majority of people. People truly believe that their guys are the right ones and that they are the ones with integrity and honesty, unlike the others in that business. The trouble is just that, it’s a business. Every politician gets into politics with the best intentions and values and the determination to change things for the better. The trouble is that everyone of them sooner or later gets sucked into the dirty side of politics whether they want to or not, and if they don’t they get out of the political game all together. George Clooney revealed most of these truths last year with his political whirlwind drama last year, The Ides Of March. Following the campaign team of Governor Mike Morris (Clooney) and his advisors played by Ryan Gosling and Philip Seymour Hoffman. Mike Morris is the one honest guy in the game. His beliefs and way of doing things will change America for the better and he’s the guy who can get it done. Vying for the democratic party nomination and close to getting it done, he’s going to be the guy americans can be proud to have as their president. His campaign is on the up and up and won’t play the dirty tricks and won’t sling the mud with the rest of them. With Ohio being the swing state for the nomination, the campaign is diligently working in Cincinnati to wrap up the nomination with a win there over the Arkansas senator. But when Senator Pullman’s campaign director attempts to steal the bright and highly useful Stephen Myers (Gosling) away the ball starts rolling that will either sink the campaign for Morris or drive him right into the white house. With a cast that’s a who’s who of great actors and can’t miss up and comers, The Ides Of March delivers phenomenal dialogue at every turn leaving you entranced in the drama and spiral that happens everyday in the political world. Masterfully directed by Clooney who also gives a great performance and campaign speeches better than anyone running for public office right now. Clooney shows the dirty game involved, not just with a presidential campaign, but any one who is running for an office of any kind. The story is one as old as this country and happens more than CNN and FOX news could even report. What isn’t seen every time are the internal affects it has how it shapes the way a campaign is set up. 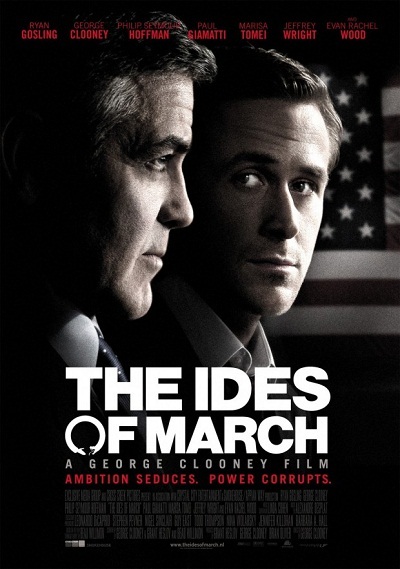 With top notch performances all around and pace perfectly set by Clooney, The Ides Of March will have you thinking and slightly stunned long after you are done watching it. Clooney proves that he’s out to make good movies no matter what and that he is the force in Hollywood that the town needs to continue putting out not only timely entertainment but flat-out good movies.